A big earthquake occurred south of Istanbul in the summer of 2016, but it was so slow that nobody noticed. The earthquake, which took place at mid-crustal depth, lasted more than 50 days. A novel processing technique applied to data from special borehole strainmeter instruments and developed by researchers from the GFZ German Research Centre for Geosciences and collaborators successfully identified the ultra-slow quake below the Sea of Marmara. The team, led by Patricia Martínez-Garzón, has published the results in Earth and Planetary Science Letters. The region south of Istanbul is part of the North Anatolian Fault, separating Eurasia from the Anatolian plate. This geological fault is a large tectonic plate boundary known to generate destructive earthquakes causing large numbers of casualties. The last such major earthquake occurred in 1999 near Izmit, causing almost 20,000 fatalities. A portion of the fault, running just south of the densely populated mega-city of Istanbul, is currently identified as a "seismic gap," and is overdue to produce a large earthquake. While the tectonic loading due to plate motion is continuous, thereby constantly accumulating elastic energy on faults, the release of the stored energy can occur either seismically in the form of earthquakes, or aseismically during fault creep or slow deformation at depth. Understanding the interaction between both phenomena is critically important to define the seismic hazard and subsequent risk in urban areas. The study in Earth and Planetary Science Letters reports on a large, two-month-long ultra-slow earthquake that occurred south of Istanbul below the Sea of Marmara in conjunction with elevated moderate-sized seismicity at shallow depth in the region. The researchers investigated the crustal deformation data from borehole instruments installed around the eastern Sea of Marmara as part of the GONAF Plate Boundary Observatory. Data from one of the borehole strainmeter stations located in the most seismically active portion of the area on the Armutlu Peninsula was processed using novel computing techniques. Dr. Martínez-Garzón, lead-author of the study, says, "This allowed us to identify the slow slip signal that presumably occurred at mid-crustal depth level and that is of the same size as the largest ever seen such signal that occurred along the San Andreas Fault in California." During this aseismic slow deformation signal, the shallower and typically fully locked part of the crust responded by producing the highest number of moderate earthquakes in years, indicating an interaction between near-surface and deep crustal deformation. Prof. Marco Bohnhoff, head of the GONAF observatory and a co-author of the study, says, "How this interaction works remains to be understood in detail. In any case, our results will allow us to better understand and quantify the regional seismic risk, in particular for the 15 million population center of Istanbul in the light of the pending big one." 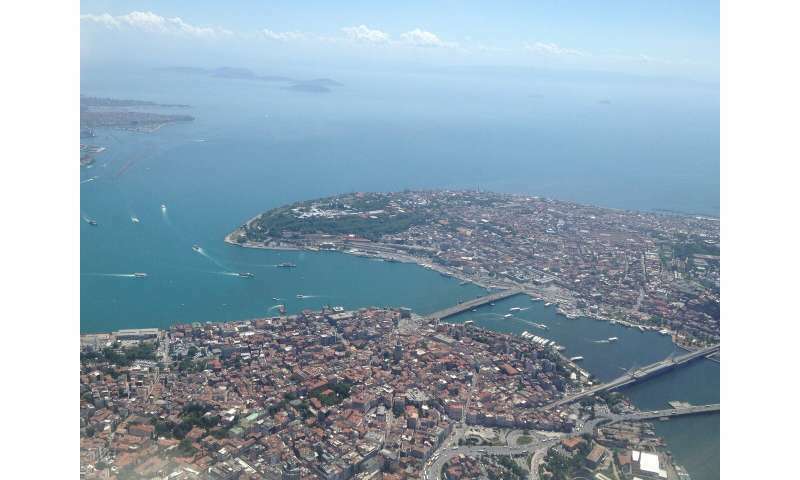 Micro-earthquakes preceding a 4.2 earthquake near Istanbul—an early warning sign? Seismic gap outside of Istanbul: Is this where the expected Marmara earthquake will originate from?